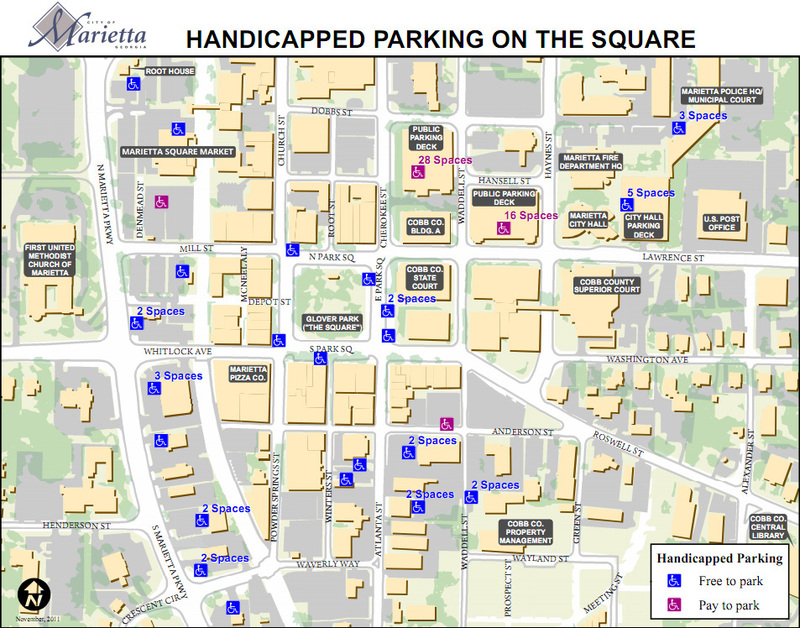 There are numerous free and paid parking options throughout the Marietta Square area. 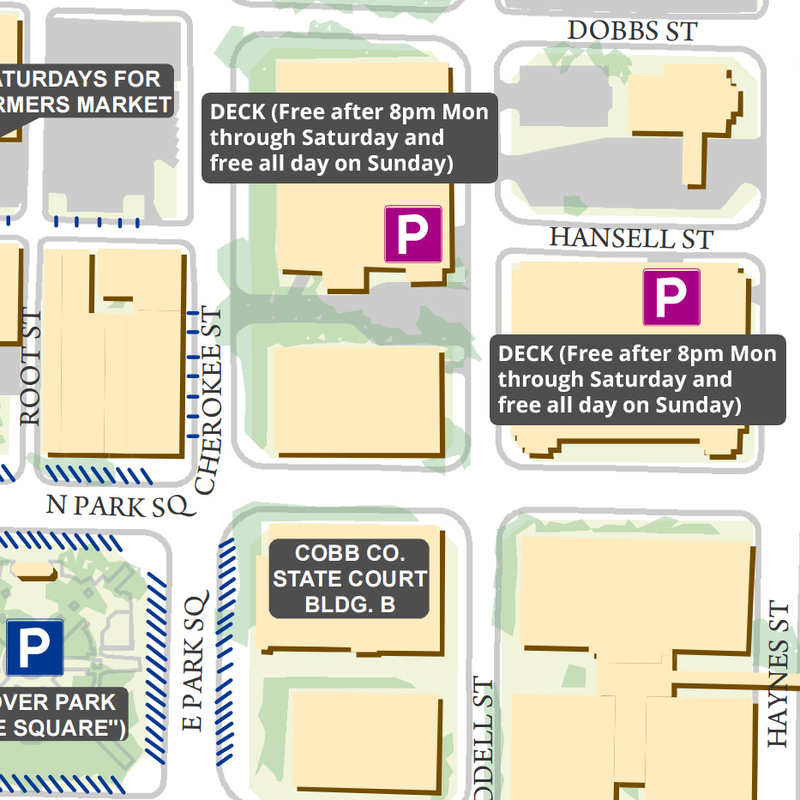 The Square features both paid and free parking lots, as well as free parking spaces and several parking decks that are free to park after 8pm Monday through Saturday and free all day every Sunday. 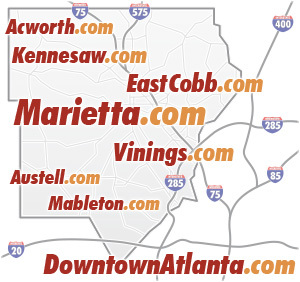 The maps below will help you find the right place to park for any location or event. Weekday and Saturday parking between 7am and 8pm will be free for the first 30 minutes, then $2 for up to two hours, $5 for two to five hours, and $7 for more than five hours or for a lost ticket. Parking is free Monday through Saturday after 8pm and free all day on Sunday. 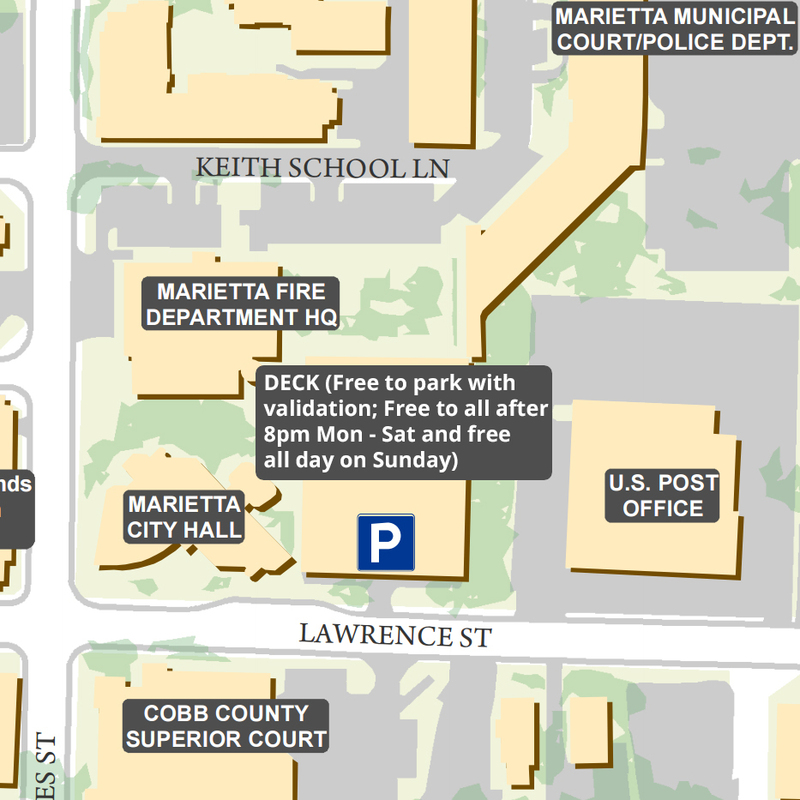 Free two hour parking is available in the numerous parking spaces surrounding Glover Park in the center of Marietta Square. 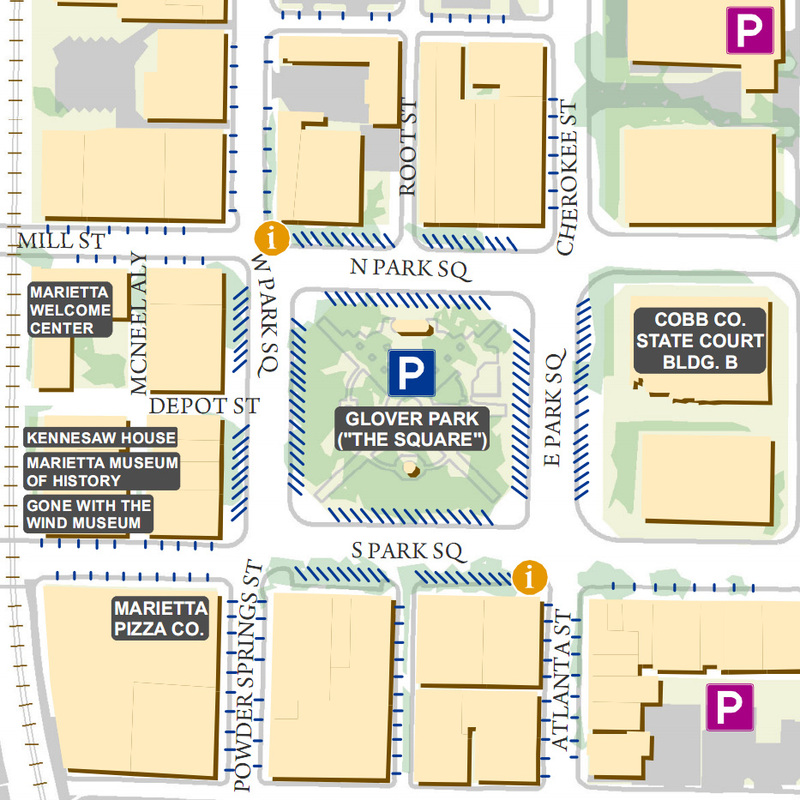 Additional parking is also available down many of the side streets surrounding Glover Park. 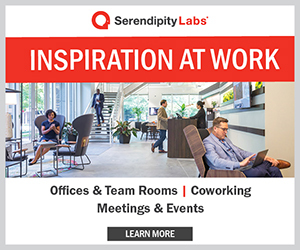 Free parking is available in the upper levels of the Lawrence Street parking deck for those with city business Monday through Friday, and parking is free for everyone on after 8pm on Saturdays and free on Sundays. 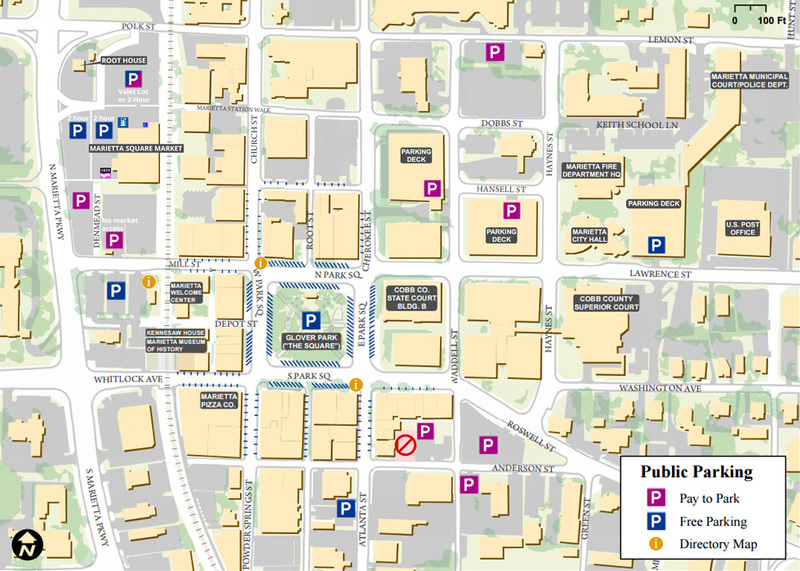 Private parking lots ($5) are located near the intersection of Anderson Street and Waddell Street. Be sure to only park in the paid lots and pay for your space. 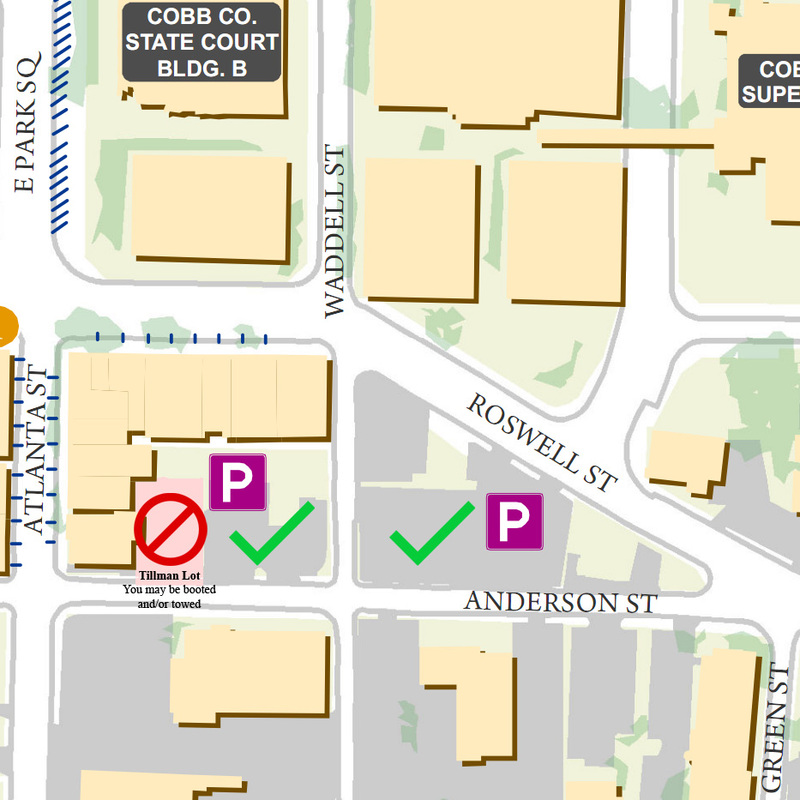 Watch out for the adjacent lot with the sign reading “Parking for 25 & 27 Atlanta St. ONLY!” as you may be booted or towed if you park there (known as the Tillman lot – marked in red above). 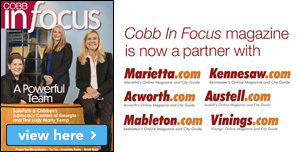 The Cobb County Parking Deck (top left) and the Lawrence Street Parking Deck (bottom right). 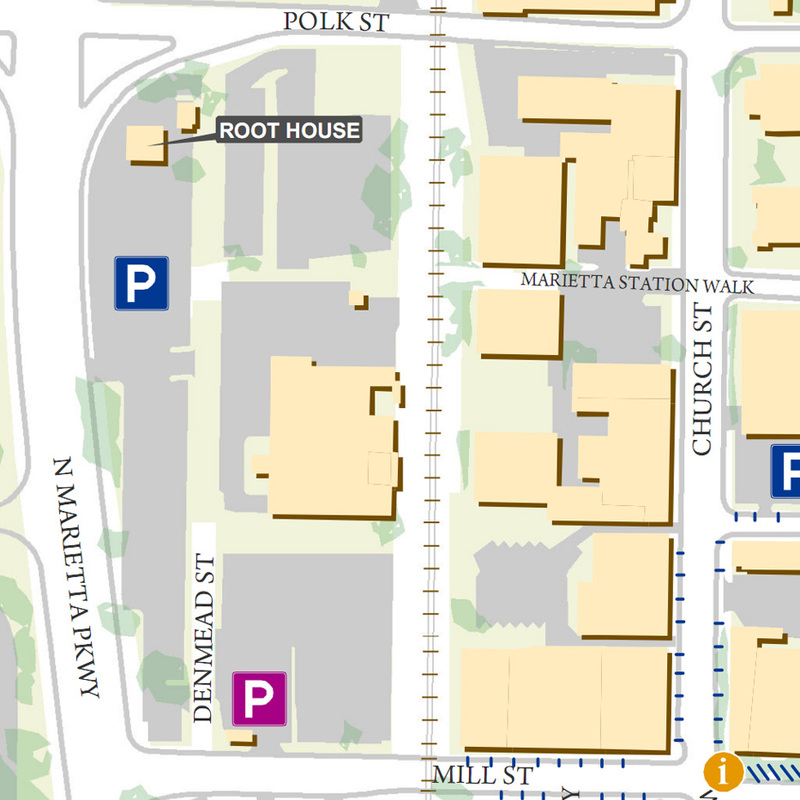 The Lawrence Street parking deck’s entrance is on Hansell Street. Both decks feature free parking after 8 pm on Monday through Saturdays and free parking all day on Sunday. 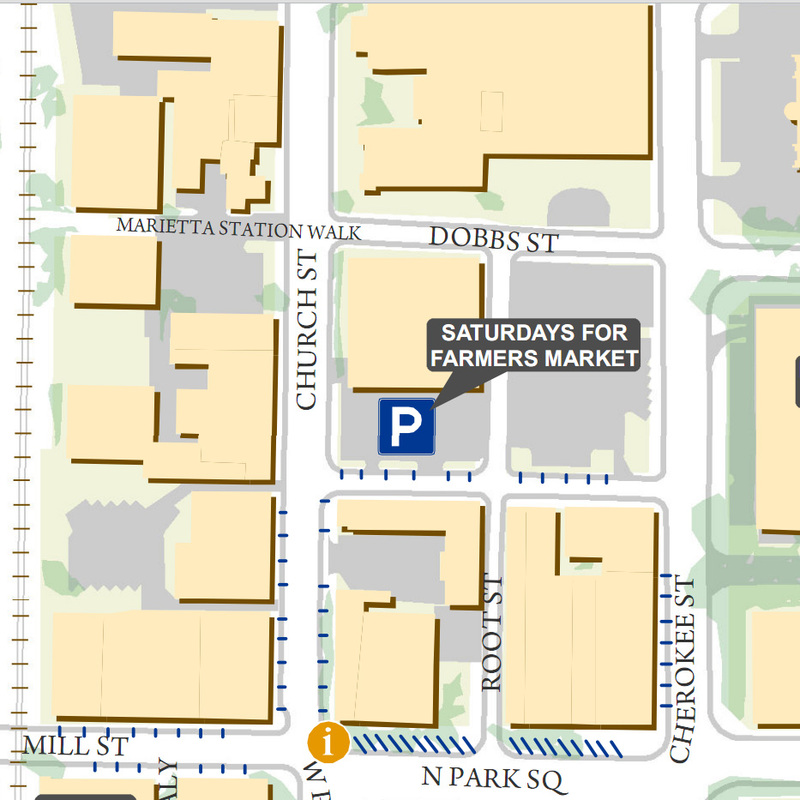 Parking is available on Saturdays in the First Baptist Church parking lot, next to the Family Life Center. The lot is located at the intersection of Church Street and Hansell Street. No parking is available in this lot on Sundays. 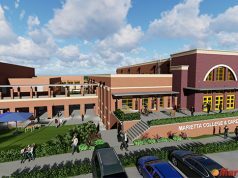 Free two hour parking is available in the parking lot across the railroad tracks from the Marietta Welcome Center. Free parking next to the Marietta Root House Museum. 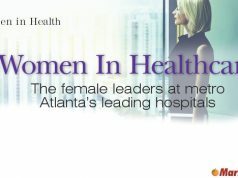 There is also a paid parking lot near the intersection of North Marietta Parkway and Mill Street. Please for the love of parking…make the Cherokee St. Parking Deck’s signage BIGGER & closer to the entrance. Plus, move it CLOSER to the entrance. People DON’T notice it because the original sign is: 1. On the ground/ground level, 2. it is painted brown, 3. it is placed way beyond the entrance & people have already passed it. Are the parking decks open 24 hours? What bunch of crap!! This is going to hurt the farmers market. 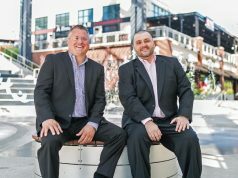 The market brings customers to the square and the city forgets that. Greedy!!! Maybe this money can pay for some more fancy sidewalks. 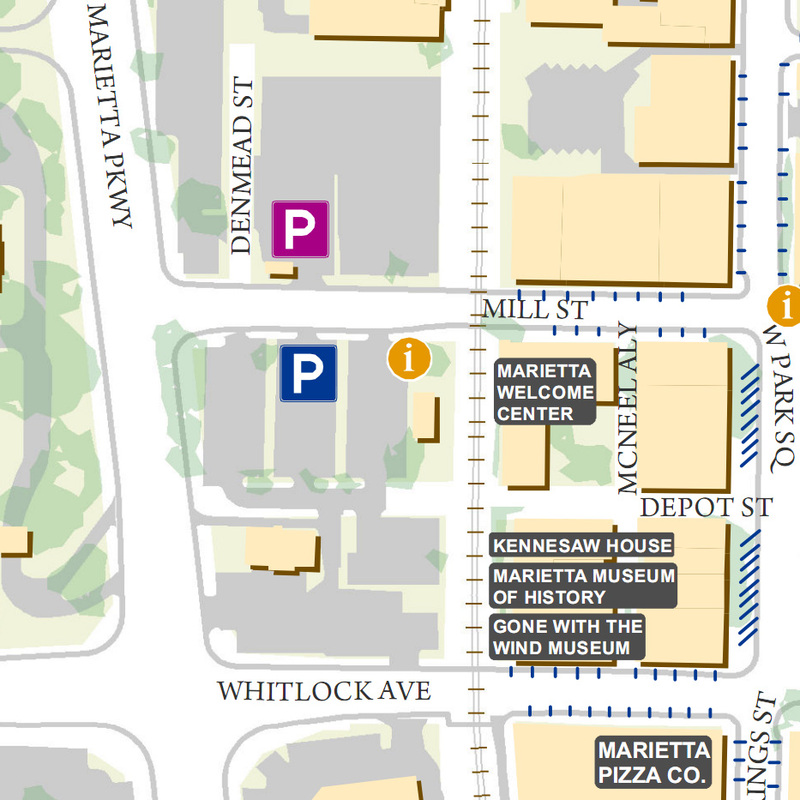 I used to love going to Marietta Square, in part because it was always free and easy to park, but I have stopped going very much since being charged for parking. Can’t help but feel it’s going to hurt the local businesses on the square.